It is a great privilege for IMC to having his acceptance of becoming the adviser of IMC system. He is the role model in medicine in Vietnam with numerous studies finding many Vietnam traditional medicines that were highly appreciated by not only Vietnam but also the international science community. Dr. Kinh Phan Quoc was considered as the pioneer who broke the wall separating between modern medicine and traditional medicine. Especially Berberine tablet, this is the first herbal medicine was approved in Vietnam which cured millions of residents from dysentery in Vietnam in the 1970s. In 1997, when going to America to attend The International Anti-Aging Conference organized by the The American Academy of Anti-Aging Medicine, Dr. Kinh was extremely amazing with the wide development and use of dietary supplements in America. These products contained many extracts from plants and animals and natural bioactive compounds such as vitamins, flavonoids, carotenoids, amino acids which were used to protect and promote health for community. Basing on rich biodiversity of Vietnam and traditional medicine combining with modern pharmacology, medicine, chemistry, Dr. Kinh Phan Quoc conducted many studies to manufacture many dietary supplements from herbs of Vietnam like Tribulus terrestris, Bacopa monnieri, Tagetes erecta L, Soy bean sprout, Broccoli Sprout… Uphaton (anti-aging for men) và Tiên Dung (anti-aging for women) and are the first dietary supplements manufactured in Vietnam market. Dr. Kinh Phan Quoc is author and co-author of pharmacological literature, some of these are high in academic value like ‘ The narcotics of Vietnam”, Vietnam traditional medicine for the poor” which was published 1000 copies and sent to regions where ethnic groups live. In 2016, Dr. Kinh Phan Quoc was the editor of the book “Understanding and usage of dietary supplements”. In 2009, Vietnam Institute of Dietary Supplement (VIDS) was found by Dr. Kinh and Assoc. Prof. Dr. Tran Dang, Doctor and Lawyer Tran Minh Hai, and Pharm. Nguyen Xuan Hoang, becoming a modern scientific institute with highly qualified scientific staffs and sufficient facilities. Center of Biotechnology, a center of Vietnam Institute of Dietary Supplement (VIDS), specializes in research and manufacture biotechnological ingredients such as Probiotic, Enzym, and probiotic-derived ingredients (DeltaImmune) … Quality control center, another center of VIDS, were official recognized as an analysis laboratory to measure quality and safety of dietary supplement products and ingredients. Many dietary supplements were investigated and developed by Vietnam Institute of Dietary Supplement (VIDS) such as Genecel plus (boosting immunity system), Kidsmune Plus (boosting immunity system), Kim miễn khang (boosting immunity system), Minh nhãn khang (improving eyesight), Manlink (stimulating male sexual health), Ỷ Lan (anti-aging and stimulating female sexual health) which were manufactured by IMC, Hong Bang, Au co and widely sold in Vietnam market. 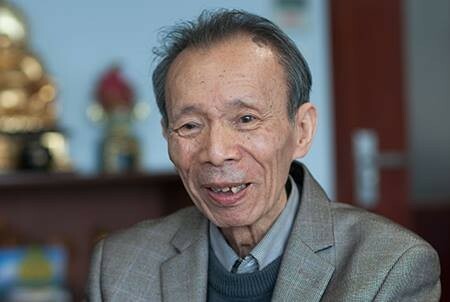 At present, Dr. Kinh Phan Quoc is over 80 years old, and becoming frail but he is still passionate about studying nature bioactive compounds from plants and animals in Vietnam to manufacture medicines and dietary supplements for protection and enhancement of health for community.